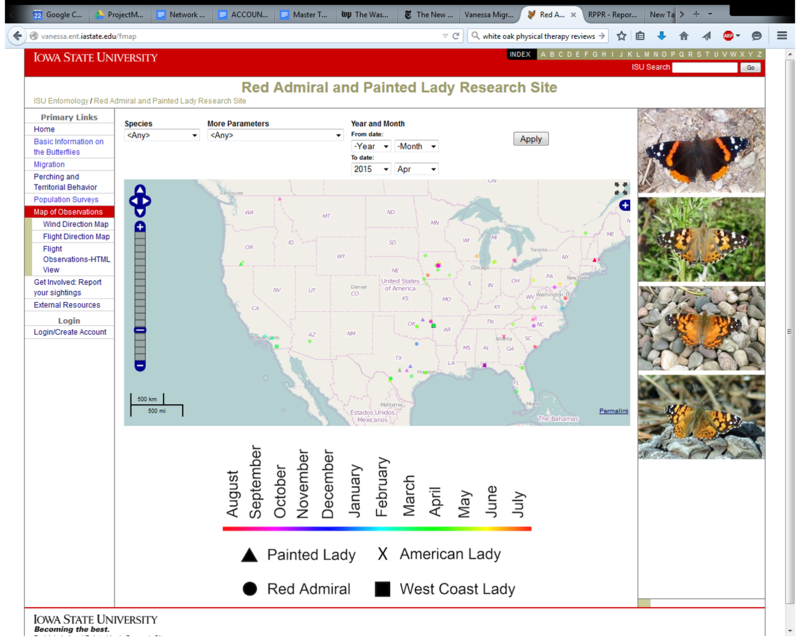 This project is to coordinate observations of territorial behavior, migration, life history, population studies, seasonal variations in abundance and body size, and number of broods per year (voltinism) of butterflies in the genus Vanessa, including Vanessa atalanta, V. cardui, V. virginiensis, V. annabella, V. tameamea, and V. kershawi. (Red Admiral, Painted Lady, American Lady, West Coast Lady, Kamehameha Butterfly, and Australian Painted Lady). Although the lady butterflies of the genus Vanessa are not as familiar or as well-studied as the Monarch (Danaus plexippus), their behavior and migration are likewise well worth observing. Much remains to be discovered about their habits and how their behavior and seasonal distribution varies by geographic location. Observers and experimenters ranging from casual to serious can discover new and valuable information about these butterflies.